Update July 30, 2012: R.L. Mathewson landed on the August 5 New York Times Bestseller List, which came out July 30. Please join us in congratulating R.L. on her amazing success! R.L. Mathewson is the author of eight novels in the paranormal romance and contemporary romance genres. She lives in New England with her two children. Her books feature down-to-earth characters dealing with vampires, werewolves and demons, and are characterized by a distinctive sense of humor. Over the past year, sales have grown impressively. In the last few weeks, her books have broken out at Apple, and in the last week, two of her titles have held steady among Apple's store-wide top-ten bestseller list. In our interview, she discusses some of the secrets behind her success. David Weir: When did you start writing and did you ever try selling your books through the traditional publishing industry? R.L. Mathewson: I started to write in 2008 after my love for reading was rekindled during a rough time in my life. I was pretty much bedridden for a year with a ruptured disc in my back that was pressing directly on a nerve. It was a very painful experience, one I hope to never experience again. I used books to distract myself from the pain and boredom. I could only lay in a bed or sit prompted up during the day to watch my two young children at the time, so I had a lot of time on my hands. I probably read a book a day. Some of the books were really good, but others were just horrible. The worst thing was a poorly written book with a great concept. It was aggravating more than anything. I started to think about how I would change the story and one thing led to another until one day I grabbed my ice pack and made my way over to my desk and started writing. I looked into publishing traditionally at first. I did some research and made a few contacts, but what I found wasn't very encouraging. By the time I had two books finished I pretty much gave up hope of publishing because the hassle to go the traditional route just didn't seem worth it. DW: How did you discover Smashwords, and how has it assisted your publishing and distribution strategy? RLM: I discovered Smashwords by accident. At the time I was trying to get my ebooks sold through Borders.com. I couldn't find a way to self-publish through the site, so I contacted customer service and was directed to Smashwords. Publishing through Smashwords has made the process of publishing really quite easy. I still self-publish through Amazon.com and B&N through my own accounts for the older books, but for iBooks, Kobo, etc. I find it easier to go through Smashwords. It saves me a great deal of time and if I have a problem, I found that Smashwords customer service is really helpful. That's a huge plus for someone who publishes on her own. With the new improvements that they've made, I've decided to distribute all future books solely through Smashwords for distribution to Amazon.com and B&N to further simplify the process. DW: Did anyone encourage you to write along the way; or alternatively discourage you from trying? RLM: My mother encouraged me to do it as something I enjoyed as a hobby, but I think she was nervous about me relying on writing to support two young children. To be honest, I was too, but at the time I didn't have much choice in the matter. When I started writing it was an escape from the pain as well from a horrible marriage. With back problems, two children and zero help, I was in a bad situation. I basically put all my hopes and prayers into my writing, pretty much pushing myself to the point of exhaustion every day, hoping that it would work out for us. I would have to say that my children, Kayley and Shane are all the encouragement that I needed to keep going, but the encouragement that I received from readers helped out a great deal as well. DW: When and where did you publish your first two ebooks? And how soon after that did you make your first sale? RLM: I published my first two books, Tall, Dark & Lonely: A Pyte/Sentinel Novel and A Humble Heart: A Hollywood Hearts Novel in December of 2010 at Amazon.com and Barnesandnoble.com. It was a nerve wracking experience and I wasn't even sure that I did it right. For the first couple of days I kept checking my accounts to see if I sold a book, but after a few days of no sales I sort of gave up and stopped checking. I didn't have an advertisement, no followers and basically no one really knew about the books. I realized that I had to figure out a few things in order to make a sale so I focused my attention back to writing while trying to figure out how to do just that. A few months later on a whim I checked my accounts and I saw that I made my first sale on Christmas Eve at Amazon.com. By that point I'd sold a grand total of maybe five books, but I didn't care. I was so excited. I remember getting my children out of bed, because I just had to share the news with the two most important people in my life. They were so excited. We danced around singing "We sold books, baby!" for probably a good hour or two before I managed to get them calmed down enough to go back to bed. It was a really great night for us. DW: Do you remember when your first fan contacted you, and how that felt? RLM: The first email that came from a reader was definitely a surprise. It was a really nice surprise and made my day. Apparently, she had to hunt down my email, because my website at the time, the one I created and may have messed up, hid the email link, which apparently wasn't working anyway, lol. So, she searched the web for a few days and when she found it, she explained that she enjoyed my book, which surprised her because she hadn't expected much based on the plain cover. At the time I designed my own book covers, which consisted of a solid color, the title and my name. That was it. It was really horrible. Even I can't help but cringe when I think back to the early covers. DW: How did you use social media to gain more exposure for your first two books, and what was your first real breakthrough? RLM: My first breakthrough without question came from Rhonda Valverde, owner of Vampireromancebooks.com. I found the website by accident one night when I was searching for places to post an excerpt about my book. I found the website and took a chance, not knowing whether or not my post was going to be deleted or if anyone would even read it. Within the first day I received a lot of positive feedback. Within a few weeks Rhonda left a reply asking if I'd be interested in a review. I was nervous, but I figured that it couldn't hurt. Up until that point no one had read the book so I was desperate for someone's opinion. A couple agonizing weeks later she sent me an email telling me that she enjoyed the book. She posted a positive review and Tall, Dark & Lonely started to sell. I use social media, but I use it to get to know my readers. They're wonderful people and I really enjoy our daily interactions at Facebook and Twitter. We set it up as a casual online place to meet up, chat about books or nothing at all. I also use it to post updates about my books or share any news that comes my way, but it's mostly used just to relax. DW: How have you changed the way you price your books and what have you learned in the process? RLM: When I first published my books, I was more concerned about being taken seriously. I didn't think a low price would accomplish that. So, I priced my books as high as the traditional published authors at the time, $6.99. I eventually brought it down to $2.99, because I felt the high price was just too much. This past Christmas I dropped the price to $0.99 as a Christmas gift to my readers. I didn't like the idea of people spending a small fortune to read my books. I also gave one of them away for a while, Playing for Keeps: A Neighbor from Hell novel. When the time came to raise the prices back, I just couldn't do it. I'd received too many emails from readers thanking me for keeping my prices low, sharing stories of tough times and how thankful they were that my prices were low enough for them so that they could read my work. After that I decided that as long as I could manage the costs that came along with publishing, that I would keep them at $0.99. I enjoy writing and I would rather someone have the opportunity to enjoy my stories than to get rich. DW: How did you connect with your two editors and how have they helped you improve your writing? RLM: I have two wonderful editors, Lieve Van den Heuvel and Maura O'Beirne-Stanko. I met Lieve through Vampireromancebooks.com after she read one of my books and left a post for me at the forum. For a while we simply left each other posts, chatted once or twice on a message board until she decided that she was going to get me addicted to Belgium chocolate, lol. After that we somehow moved onto the topics of my books and she'd help me out by pointing out editing mistakes. Maura came into the picture after she sent me emails, telling me how much she enjoyed the stories, but the editing was horrible. We exchanged emails for a little while and soon I was asking for her opinion as well. The last book, Tall, Dark & Heartless, was our first editing collaboration. The three of us worked for three weeks making that book perfect. It took several tries, but I think we did a decent job with it. We're constantly going back to the earlier books and trying to fix those as well. They've helped me more than I can say. They're both wonderful, kind women and I am very fortunate to have them on my side. DW: In the past few months, sales of your books have really taken off, and within the last few weeks, your sales exploded at Apple's iBookstore – what changed? RLM: In the past eight months I've made a lot of changes. The books have gone through an additional editing. The price dropped as well, making them more affordable. Word of mouth has gone a long way to help, but I think it was the change in covers. The last ones were plain, two shaded covers that looked more like pamphlets than anything. Some people liked them because it created mystery while others admitted that the covers were really confusing. After some thought and advice from Maura, Lieve and Christi, from BookRhythm.com, I decided that perhaps we should look into new covers. to the top of Apple's store-wide bestseller list. The only problem was the prices. Since buying custom designed covers would have been expensive and forced me to raise the prices of the books, I decided to see what I could do on my own. I bought a few photos, played around with some photo editing software and eventually came up with some covers that I liked. DW: You’ve labeled the genres of your first eight books paranormal romance and contemporary romance – what are the key elements that help these books succeed? RLM: From what I've heard from readers, my characters are flawed, down to earth and likeable. Basically, they're human. I take my time building my characters from scratch and give the reader a reason to root for them. I also take my time to build the romance and to show them falling in love. I don't take short cuts in my story line or character buildup. I also try to keep my story lines unpredictable and interesting. I might play around with an overdone plot, but I refuse to follow the rules. DW: Are you considering trying writing in any other genres in the future? RLM: Yes, I am currently writing a historical Neighbor From Hell. I didn't plan to, but I was too curious to see how the Bradford men would drive a woman crazy in the nineteenth century. DW: Romance is a huge category at Smashwords, accounting for 30% of our sales. Why do you think romance ebooks are so much more popular than their print counterparts? RLM: Ninety-nine percent of my sales are ebooks, but that's because I don't push the paperbacks and the ebooks are not only more convenient but also cheaper. I believe the reason is very simple, it's convenient. When I want to relax with a good romance book I don't want to have to go online, order a paperback and wait a week for it to be delivered. The same could be said for a ride to the mall. Thanks to devices such as iPads, Nooks, and Kindles, I can avoid traffic, lines at the mall, and kids screaming and running around. I can do a quick search, find a story that calls to me and buy it and within seconds I'm relaxing with a new book. DW: For your fellow romance authors, what do you think are the essential secrets to writing a great romance that resonates with readers? RLM: One of the most important things that I've found that can make or break a romance novel is whether or not the connection between the characters is believable. To me, there's nothing worse than reading a book only to have the author just flat out tell the reader that the characters are in love with absolutely no evidence to back it up. Readers want to watch the characters fall in love and have a reason to hope for the best. When the author doesn't put the work in to give the romance credibility, it takes away from the story. Another issue is using plots or formulas to write a romance book. Personally, I love a good plot, even if it's been done to death, but that doesn't mean that I want to read the same exact plot. I want to see new twists, be surprised and enjoy the new take on an old favorite so much that I can't put the book down. There are several romance novel formulas out there [that] unfortunately for anyone who's read a decent amount of romance novels, ruins the story because it makes the entire plot too predictable. Don't plan the first kiss. Tease the reader. You're trying to build up the suspense because if it's not done right, it can actually annoy the reader. What I like to do is to let my characters develop while the romance blossoms. I work hard to make the my stories unpredictable and have fun while doing it. That's the most important thing, have fun. Write a romance that you're going to enjoy so your readers will enjoy it as well. DW: What will be your next book and when can we expect to see it? RLM: The next book is Checkmate, the third installment of the Neighbor from Hell series. I am hoping to have that out by fall. I also have another book that is close to being done, a stand alone, for now, paranormal romance. That one will probably be published shortly after Checkmate. DW: Please tell us about the special charitable campaign you plan for its launch and how you came up with that idea? RLM: I came up with the idea from my readers and from all the people that have helped myself and my two children get a second chance at life over the past few months. I wanted to give something back and when I started to receive emails asking for the third Neighbor from Hell book I decided that maybe that was the way to go. So, I decided that once the book was finished that I was going to delay publishing it. For twenty days I will barter the book for a good deed. For twenty days, I'm giving readers a chance to do a good deed, giving blood, donating food, clothes, helping someone in need. It doesn't matter what it is, as long as they help someone out. There will be a special printable sign that needs to be in a picture of the act. Once I receive the picture, one per person, I will send them a link to the book for download. I'm hoping to give away a lot of copies of this book. DW: What advice do you have for other indie authors who have not yet gotten up the nerve to try self-publishing? RLM: It can be a lot of hard work, but it's worth it. If you enjoy writing and want to share your work, take a chance. Research, edit and just have fun. It can be stressful, but it should also be an enjoyable process. Thanks for the great information! It is always inspiring to find out that those of us reg'lar folk can get out there, expend a bit of effort, gather an education, and come out on top. Congrats to R.L. Mathewson on her success, and a huge thank you for sharing this experience. We can all learn from this. I, for one, will seriously look at updating the covers for my seven books. Also, thanks to Mark and his Smashwords team for supporting us Indie Authors. You've done amazing things to change this business. 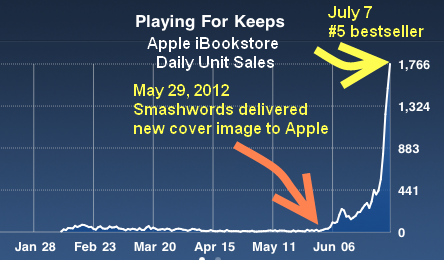 Wow that chart is amazing regarding delivering the cover to Apple. Shows the power of a great cover - and great word of mouth. I think my favorite part of this interview was when she talked about waking up her kids to celebrate. One of my good friends is a single mom who loves to write but thinks she doesn't have the time. I'm going to send her this link! These are great tips for indie authors like myself. I think I'm going to revamp my cover design and hope for sales like yours. What a great background story. To turn such a negative, painful circumstance into something so positive is inspiring. And to take the kids along for the ride - what great lessons their learning! Thank you for sharing your story and I love the charity idea! Thanks, R L. I'm about to upload my first Ebook, so it was encouraging to hear your remarks - especially on checking for sales and finding none to begin with! Good luck with your writing career. Readers do judge a book by its cover. The more I read success stories about book sales taking off after a cover change, the more I am motivated to change the cover of my book "The Empty Hammock". I had the most fun researching and writing it but it pulls the least amount of sales... though readers generally like it once they read it.